Last month, the owners of the Wayside on 12th Street near Third Avenue switched from one cafe concept to another with the introduction of Greekito, featuring Greek tacos, beer and wine, and coffee. 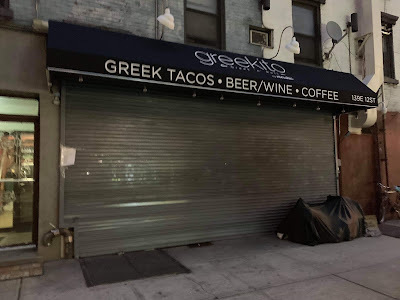 Perhaps the owners, who also run Merakia: Greek MountainThief Spithouse + Steak on West 21st Street, will get all the finances straightened out here and continue on. The Wayside, a coffee shop with a variety of pleasant cafe fare, opened in July 2013. If you look at the total amount it costs them for ONE month, it's hard to see how any business could survive in that space for that much $$$. I don't understand this. How did they have the capital to renovate yet lacked funds to pay the essential and most important cost: rent? I am lost. They should have called it day a months ago. Now, they have this amount hovering over them. If they don't or can't pay it, they could have a lien or a judgment placed against them. I agree with the other commenter. Given the rent, I don't see how they could sustain themselves, pay salaries and monthly expenses not to mention gain an actual profit. Larger, commercial spaces are doing all right because they cater to a mass following. This is the issue with our city. Smaller businesses can no longer stay afloat unless the owners are wealthy and can afford to keeping paying for things when no money comes in. This truly changes the demographic of neighborhoods. And it is sad, but this is the new norm. I've said on here before even if I had the capital, I would never invest in a cafe, bar, restaurant or store in NYC. It just isn't worth the stress or heartache. They seemed to want to try to sell more beer and wine, probably to increase their profit margin, but they are almost always closed by 10 pm now. The place would seem to function best as a coffee/study shop for the students in the dorms on the block but that kind of day time business probably can’t cover that rent. Tell me again why we are giving $1 billlion to Amazon rather than to small businesses? Because Amazon gives lots of money to politicians-especially 'progressive' Dems. 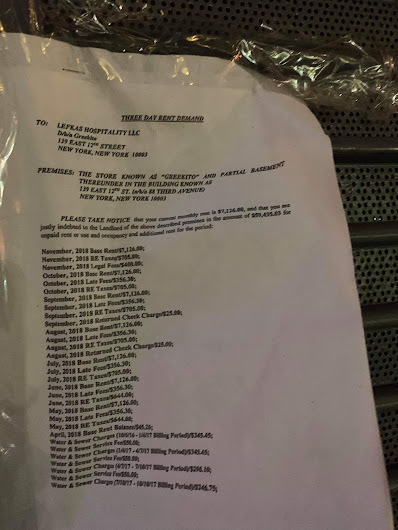 How much of Cuomo's 2020 Presidential run is Amazon financing? How much did the Mayor get? Amazon bought the Washington Post- now they are buying Washington and NYC. They have the money and want the power. "If they don't or can't pay it, they could have a lien or a judgment placed against them" - This is not how those things work.